Steiner 5114: Steiner's Riflescopes offer a wide variety of reticles perfectly suited to your hunting, competitive, or tactical shooting adventures. From clean, simple designs for fast-actiontarget shooting, to detailed, precision reticles for longrange shooting. The precisoin adjustment system pinpoints accuracy which is easily achieved with Steiner windage and elevation adjustment systems. Each scope tube is milled from solid, high-grade aluminum stock for greater strength and durability along with a variety of lens coatings for add strength, protection, and clarity and are fully shockproof and can withstand up to 900 Gs of impact.The T5Xi brings unmatched clarity, accuracy and self-assurance to any situation, from combat to competition. The Medium-Range model has a more compact design and allows for parallax focus down to 25 yards. It has an one-piece oversized 34mm Tube which provides greater elevation and windage adjustments, an angled tapered, all metal magnification ring, locking dioptor and consistent eye relief. The scope features a Second Rotation Indicator which is a Steiner exclusive that shows each mil or elevation through the indicator window on the elevation turret. 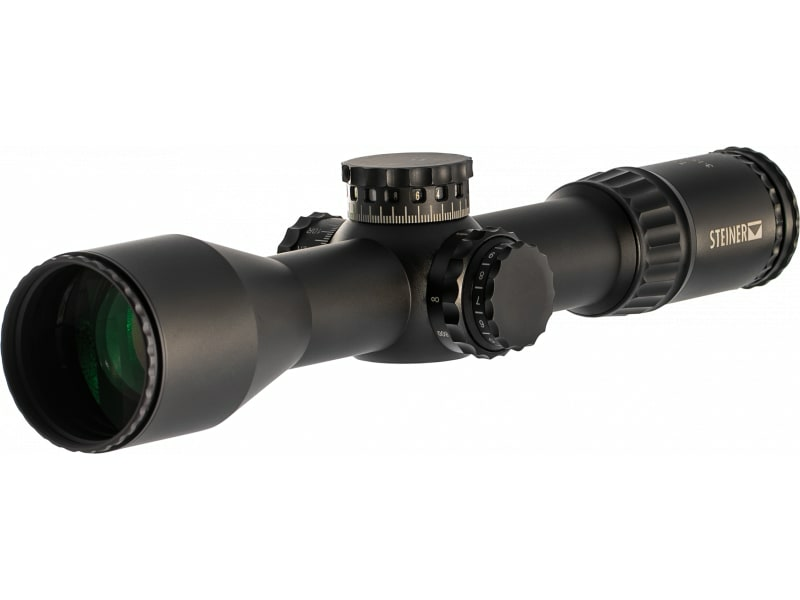 The Medium-Range scope also utilizes large, easy-to-grip Windage/Elevation/Parallax/Illumination knobs, throw lever for quick, easy magnification changes and Tenebraex lens covers to protect the lenses from dust and moisture. This 3-15x50mm model has a Special Competition Reticle (SCR) that designed by Steiner for precision competition use and is located on the first focal plane. It offers an extended illumination area, 2/10-mil windage and 1/2-mil holdover lines.